We left late today…decided to finish posting while I had internet. Our first stop was in the same park where we camped, Cave-in-Rock State Park. Does anyone want to take a guess at what we saw? Yes, it was a cave – 160 feet deep in a limestone bluff. I was afraid I might miss it as there were stairs everywhere, but obviously that would have been hard to do once I saw its large size. The cave was once a hideout for river pirates after the Revolutionary War. They would lure pioneers into the cave and take their possessions and sometimes their lives. Fortunately now, it’s just a tour attraction. I met some nice people, Don, Marilyn, and Vera, who were here visiting from the Chicago area. Marilyn said she missed seeing the cave once because the water level was too high – I didn’t think of that. They recently completed a bike ride – 300 miles over a week, stayed in churches, and raised money for an orphanage in Haiti. Forty riders raised about $50,000. Kudos to them. They peppered me with questions. I always tend to get the same few questions, “Are you camping by yourself?” and “How old are you?”. Some may ask where am I going and others ask, what does your mom think of this? 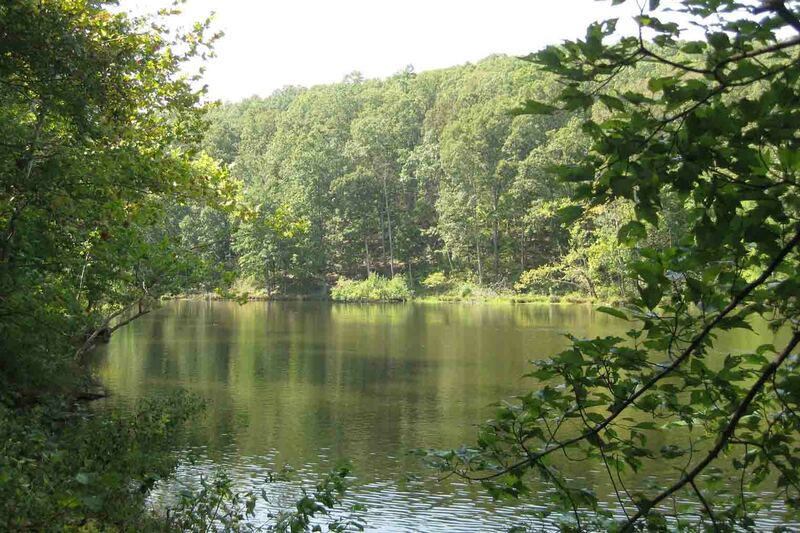 My next stop was at Pounds Hollow Recreation Area. I let the dogs walk in the shallows of Pounds Hollow Lake and then we went for a mile hike in the woods to Ox-Lot Cave. The trail was very mossy and green. Years ago, a rock overhang provided shelter to hunters and explorers and then when loggers entered the area, the overhang received extensive use. A fence was built to coral oxen, horses, and mules, thus the name Ox-Lot Cave. I met a nice couple from Michigan at the attraction. They were traveling for three weeks to see different places around the area and were familiar with the Reader’s Digest Book I have been using. They told me that the area in which they live in Michigan (northwest corner of the arm) should a scenic drive and suggested that if I get to the Holiday Gas Station look through the parking lot at the grey house and come knocking! Our next stop was supposed to be Garden of the Gods, full of oddly shaped sandstone formations. Mushroom Rock, Anvil Rock, and Devils Smokestack are a few of the names given to the rocks. Unfortunately, the entrance road to the park was being resurfaced, and it was closed. So we pressed onward. It actually gave me more time to get nearby the next scenic drive that starts in Southeastern Indiana in Corydon. I noticed Corydon is only 25 miles from Louisville – horse country. I knew of a few horse trainers there from 20 years ago, so I called my horse friend Page who is still active in the horse show world, and asked if she had Rick’s phone number. She said, “No, but here is Bobby’s”. I couldn’t believe it. He was my horse trainer for several years. I knew he had moved to St. Louis and then to Louisville, but I had forgotten the Louisville part. I thought he was still in St. Louis. So, I called him up, and surprisingly, he and Karen were both home (not on the road at a horse show), and they graciously took me in for the night. Karen was the barn manager where I rode for years. We caught up on the last 20 years, went out to the barn for a night check, and grabbed a quick dinner at Chili’s which was a welcome change from PB&J! It was so fun to see them and to be back at the barn. I love the smell of horses. I’m tempted to ride tomorrow morning before I leave! So sorry to hear about Scout….I hope she is doing much better. Totally understand your dilemma. Buster turned 10 today…time just flies. Sorry I missed your call on Sunday I would have liked to talk it was my brother–in-laws bday party all day. I hope you are enjoying your adventure and it is bringing you much happiness. You deserve to be happy. Hopefully I can catch up with you soon! Oh my gosh! How cool that you spent the evening with Bobby and Karen! As usual your photos are great. What pretty scenery! I’m not a cave person (they give me the willies) but I’m glad you enjoy them. Just watch out for rain! I’m so happy that you had a great evening with two old buddies! And, if Karen and Bobby are reading this, thank you, thank you, thank you for sharing your place and your time with Beth, Scout and Petey. I really LOVED chatting with you today. So good to hear your voice!!!!! Thanks for calling. Glad Scout is doing better. Bet the bed felt good and I’m sure it’s nice having some clean clothes! I come back to KY in December and pass through Lexington. Showed horses there every summer. Great place. Well, that answers the question of whatever happened to Karen and Bobby?! Karen looks exactly the same as she did 25 years ago! I really enjoy reading your posts everyday! Safe travels! That cave sounds awesome! Bet it was nice having a bed for a change, too.